IP Result of anti-ACE2 (IP:21115-1-AP, 5ug; Detection:21115-1-AP 1:1000) with mouse kidney tissue lysate 4000ug. ACE2 contains a potential 17-amino acid N-terminal signal peptide and a putative 22-amino acid C-terminal membrane anchor. It is the only known mammalian homologue of the zinc-metallopeptidase angiotensin-converting enzyme (ACE), a critical regulator of the reninangiotensin system. ACE2 has a more restricted tissue distribution than ACE, being found predominantly in the heart, kidneys, and testes although low levels have been detected in a variety of tissues (PMID:15983030). The calculated molecular weight of ACE2 is 92kDa but it migrates to 120kDa due to N-glycosylation (PMID:16166094). It has 2 isoforms produced by alternative splicing. 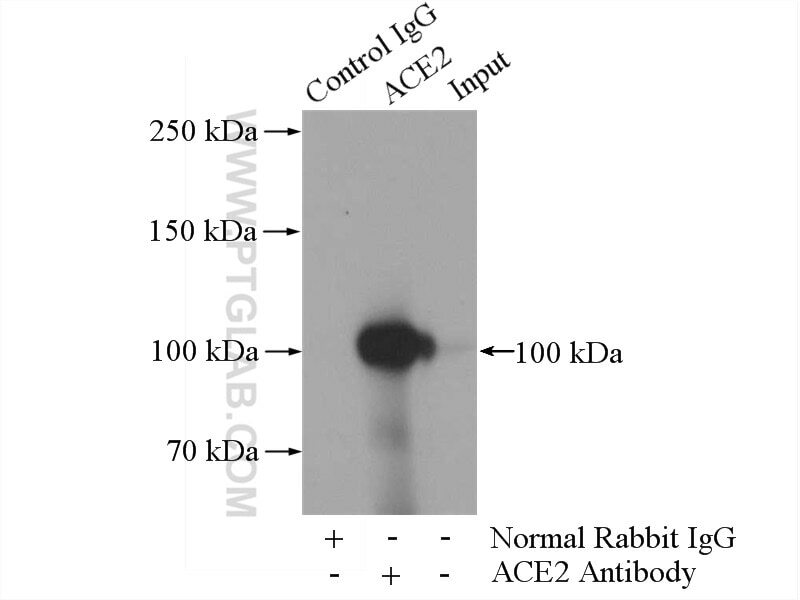 This antibody is specific to ACE2. A Human Long Non-Coding RNA ALT1 Controls the Cell Cycle of Vascular Endothelial Cells Via ACE2 and Cyclin D1 Pathway. Anti-hypersensitive effect of angiotensin (1-7) on streptozotocin-induced diabetic neuropathic pain in mice.